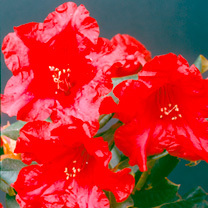 A dwarf, evergreen hybrid rhododendron with small dark green leaves. Pale green buds open to beautiful greenish-yellow flowers. Flowers April-May. Height 30-90cm. Supplied in a 2 litre pot. 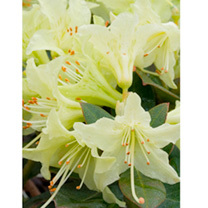 A dwarf, evergreen hybrid rhododendron. 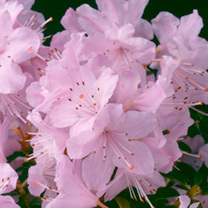 The flowers are a pretty pink with magenta spotting turning paler towards the end of flowering. Flowers April-May. Height 50-60cm. Supplied in a 2 litre pot. 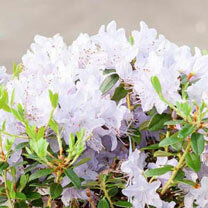 An evergreen azalea with a compact spreading habit. 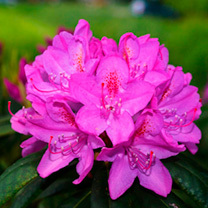 Blooming throughout April and May producing masses of magenta pink flowers. Height 90-100cm. Supplied in a 2 litre pot.